Auridon is but one of fourteen islands of varying sizes that form Summerset, which was settled directly from Aldmeris, the origin of magic and civilization upon Mundus, whether one cares to admit it or not. Many see this enclave as idyllic (especially the High Elf, who never tires informing you of these facts) but also as insular. It received visitors from Old Ehlnofey (or Aldmeris) well before our first records or maps. Over thousands of years, these immigrants became the Altmer, creating a robust civilization and extinguishing indigenous species they could not subjugate. Ask the many-eyed forest giant, the Ilyadi, how bucolic life became after sharing the land with the early Aldmer and you'll get no answer, for they are as extinct as the Gheatus or Welwa. Extermination wasn't the Aldmer's only pursuit: They farmed the land, had limited hierarchical political aspirations, and worshipped the ancestors they believed descended directly from the Divines. As the first polished stones were laid at the foot of what became the Crystal Tower, a unified people toiled together and honored their dead. Inevitably, this affinity faded as cracks in the societal structure formed (now the fissures of rank the modern High Elf is fixated on to this day). The High Nobles carved out and ruled territories. The Wise, or middle, nobility was comprised of learned persons, such as teachers and priests, who'd studied the ancient lore and applied their knowledge to society. Next were artisans -- artists, farm holders, merchants, and soldiers. Finally there were workers -- peasants, laborers, foreigners, and Goblin slaves. After this, Tamriel was settled in the second Aldmeri exodus, and the Chimer, Bosmer, and Ayleid staked claim to different regions. No mention is made of the Dwemer, who already resided in the northeastern lands. By the First Era, there was certainly animosity between the city-states of Summerset, but outside intruders were also spilling High Elven blood. The waddling Sload of Thras, with their undead hordes and infernal machines, meted out great horror to the isles. The relentless, pallid-skinned Maormer of Pyandonea wrecked even greater havoc from the seas, but the coastal carnage resulted in advancements in naval warfare as the High Elves vowed to defend their adopted home. The trip to Summerset was by far my favorite of all crossings to a new province. My High Elf companion couldn't quite hide the haughty nature of his upbringing, but his presence was certainly a vast improvement on past escorts. We discussed many highbrow topics, disagreeing on much but never coming to blows: Little wonder Telenger is regarded as a fine diplomat, or "canonreeve." In Arenthia, we boarded his tall ship -- with its extensive sails billowing like the washing lines of linen in my servants' garden back in Bravil -- sallied down the Strid River, and then cut across the Abecean Sea. This elegant Altmeri Swan Ship, flying the eagle banners of Aldmeri ascendancy over the "lesser races" of Tamriel, bore us toward the city of Firsthold. It was only after gazing from this boat's prow at the glistening shores of Auridon that I truly felt I'd entered the Aldmeri Dominion, a strange and beautiful new land. While aboard the Swan Ship, I discovered Telenger "the Artificer" was more than a mere emissary. According to his own boasts (but witnessed by my own eyes), he is something of a conjurer and magical engineer. "As you would call a dog, I have command of the Daedra at my beck and call." With the ship's crew watching with furrowed brows, Telenger formed a rather gassy cloud, out of which stepped an evil-looking devilkin. This imp scattered quickly to Telenger's shoulder and snapped its fingers, setting my breeches alight and cackling hysterically. Before I attempted to throttle it, Telenger dismissed the annoyance. Nonbelligerent atronachs offered something of a boon to Clan Direnni, acting as protectors and occasionally servants or familiars. Even the naturally mischievous imp was easily coerced into behaving. But one can always count on the natural curiosity, and almost calamitous pomposity, of the Elves, who swung the door open still farther -- a door to the Daedric planes that became impossibly difficult to shut. Hmmm. More flames on a wooden boat. Telenger challenged maritime safety practices by invoking a flame atronach onto the ship's deck, a minion far taller and more lambent than my feeble scroll-reading had achieved. As the crew's consternation grew (and water buckets were made ready), Telenger twirled and paraded the elemental as if it were attached by invisible strings. The atronach flipped and tumbled, and Telenger laughed away the singeing of the mainsail until a fuming first mate strode up, spoke Elvish into the air, and launched a heavy bolt of frost magic that dismissed the spirit, leaving behind a small pile of fire salts. "By the mighty winds of Aldmeris, storm atronach, appear!" This utterance and a small whipping maelstrom announced the arrival of another powerful elemental force, one held together by chains and electrical magic. A polite ripple of applause echoed around the ship as more crew members arrived to watch the spectacle. Enthusiasm soon waned as a bolt of lightning shot from the atronach's fist, narrowly missing the cabin boy. As the deck boards began to strain under the shock Daedra's weight, Telenger dismissed his plaything. 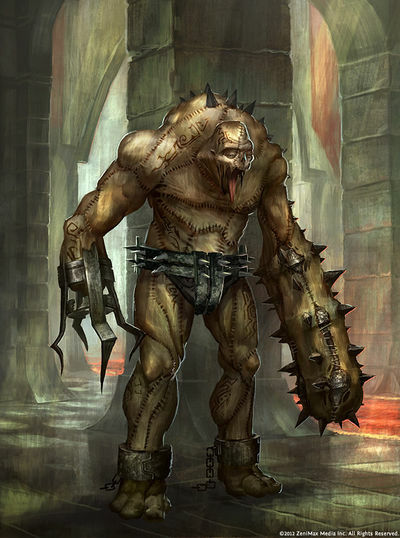 Telenger's next action confirmed the whispers I'd heard that he was something of a loose catapult: in an excess of enthusiasm for Conjuration, he summoned a flesh atronach. Moans built to a crescendo of disapproval as the revolting flesh atronach shambled toward the bridge, spinning rusted blades fused to its miserable skin. Telenger chased after it as it ambled into the captain's cabin. "Get that abomination off my ship!" a generously proportioned High Elf (with highly polished captain's armor) instructed in no uncertain terms. As the golem deflated, I glimpsed the undead of the Worm Cult in my memory again, rising in the crypts of Hammerfell. I shuddered as the fear came flooding back. Auridon is the eastern bulwark of the Summerset Isle archipelago. The island is well defended by the veteran warriors of its Elven clans; invaders can expect no respite even if they breach shore defenses. Auridon's oldest city of Firsthold, for example, sits behind a vast wall of immense and craggy cliffs along the northern coast, impassible from below except for a single, well-guarded hollow large enough for a ship to enter into the lagoon where the port town was built: The attrition of ocean waves if likely to topple this settlement before any marauder. Exotic and paradisiacal, the jagged promontories to the north soften and rise still further to form the white granite mountains in the island's middle. Vast deciduous forests of laurel, maple, and larch trees grant the land a lush but unkempt appearance. Venture along the boundless tracts of unspoiled wilderness, but bring a weapon with you; wild bears and wolves hunt here, along with gemlike arachnids and odd, unmentionable entities summoned and left to forage by Altmeri mages. This lush and verdant realm has towering escarpments, emerald woodland, and pale off-white sand dunes. The High Elves (or Altmer as they insist on being called) prune and dig at their near surroundings in an effort to tame the rugged but beautiful countryside. 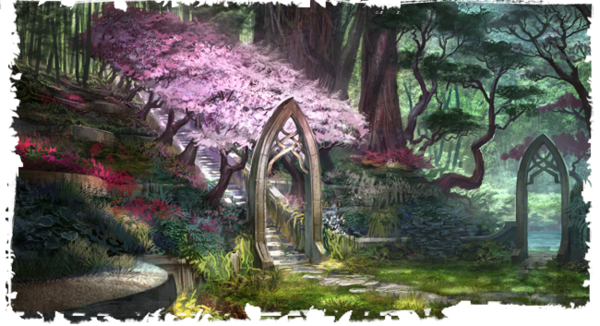 However, away from this cultivation, much of Auridon is wild, untouched forest that shrouds ruins from another era. Dwell here for long, and expect enduring traditions unchanged for centuries and stunning architecture or similar age. As we strode down the gangplank and onto the pristine Firsthold docks, the Swan Ship captain gave us a look that could curdle Mara's milk. Ignoring this, Telenger dismissed his attendants and bodyguards as we headed out from beneath North Beacon. The exquisitely tied bunting, lavender, and ceremonial petal bowls -- these couldn't be for us? No, that was laughable. Telenger informed me that Ayrenn -- known to the High Elves as the Unforeseen Princess -- returns to the isles. Her ascent to the throne was a surprise, as she had been long missing and presumed lost, but apparently the death of her father, King Hidellith, was responsible for her unexpected return. We turned to see rows of glass-plated guards lining up to welcome her shining Swan Ship, which headed into view behind Telenger's own, now-diminutive boat. Telenger nudged me in the ribs and told me of Ayrenn's exploits. Apparently, she had sparred with a Redguard Ansei from Hegathe and was made a honorary sword-adept, had bested a Briarheart of the Reach by ripping its essence from its rib cage in mid-fight, and even outdrank Queen Mabjaarn of Windhelm in a mead-quaffing competition. Either Telenger had sources of gossip unknown to me, or his stories were as preposterous as his own audacity. But Ayrenn had a sense of theater. Attired in gleaming Altmeri battle armor and flanked by heralds with streaming banners, she forwent a stately walk and leapt from her Swan Ship the moment it docked, eliciting gasps and cheers from the assembled crowds (muted, of course, as these High Elves expect decorum under every circumstance). She marched up the docks, past two heavily armored guardians, and through to the tent where the collected nobility were waiting. After offering a small curtsy to her mother, Kinlady Tuinden, she began to take command of the festivities as if the crown already rested upon her flaxen-haired head. Her striking form and exotic beauty are marred only by her excessive tallness. "Fivefold venerations, Princess Ayrenn!" Telenger exclaimed with a simpering bow, both long and low, in front his soon-to-be queen. As Ayrenn passed me by without so much as a downward glance, Telenger leaned in again. I granted him an ear: "If you thought this stuffy glad-handing was a trifle awkward, my foreign friend, linger until the greetings from the Sapiarchs of the Crystal Tower are over. The power in Summerset is about to change hands." It seemed four of the hands Telenger spoke of belonged to Prince Naemon and his fiancée, Kinlady Estre of Skywatch, and it was power they had gripped most tightly. As the presumed (and now former) heir, Naemon had not anticipated his older sister's return. Now Ayrenn was to be formally welcomed back to the isles to take the throne, and judging from the pair of them, this reception was simmering with acrimony: You could almost see Naemon steaming under his exquisite robe, and after Ayrenn passed her by, Estre gritted a grimace that could frighten a werewolf. One of my legs had gone to sleep by the time the procession into Firsthold began to snake its way up the paved and astonishingly clean streets to the royal castle. Despite their loftiness, the Altmer's cavalcade was dawdling and rather stiff. Still, this afforded me time to gaze at the various well-built structures along the parade route. "Hail to thee, dignitaries, guests, and children of Ehlnofey! The sacrament of the feast shall begin after the strumming of the ancestral lutes." Stepping into the great hall to sit at an immense long table hewn from a single (and ancient) tree, we were both delighted to find it groaning with Elven delights and drinks. As a call of gatherers and the strings of lutes echoed through the grand chamber, we gorged on peacock confit and kippered silvertrout washed down with golden pear ale. Exceptional gorging! Soaring and graceful, or static and repetitive: High Elven architecture divides Imperial critics much like a painted cow at a Reachman feast. Their curved gables and strong, pointed steeples emphasize height, with ceilings a giant would have trouble scraping his head on and rooftops stretching proudly up toward the firmament. Their structures provide a visual echo to the "High Elves"' appearance, as they try to contrast their structures with the abodes of other races. 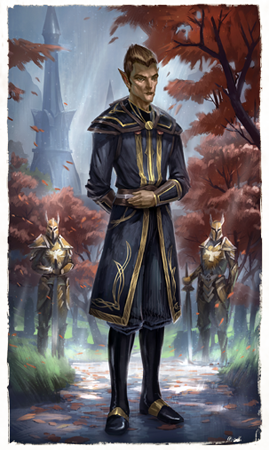 The more perceptive of historians (such as Cantaber Congonius of Skingrad) have discerned clear similarities when comparing settlements of the Altmer and Ayleid, unmistakably because they share the same ancestors. Where the Ayleids departed Summerset Isle, the Altmer remained; yet their structures share many common elements. One only need walk the ruins near Bravil and then compare paintings of Skywatch for corroboration. Subtle changes are less obvious: While the Altmer are snobbish, they never sank to Ayleid levels of perniciousness, and the more refined buildings of Auridon reflect this. Such structural design stem from ancient roots, using methods tried and tested, but not to the point of becoming obsolete. The Altmer seek refinement rather than innovation, and they are conceitedly resistant to large-scale changes but are content to tinker. The results reveal highly sophisticated precision, harmony, and the selection and repetition of orthodox compositions. Echoing the High Elves' physical forms, their architecture is elongated and finely chiseled. But I'd rather spent time gazing at the soaring arches, skyward buttresses, and other graceful framework of an Altmeri home than conversing with its inhabitants (being as they are, by and large, acid of tongue and disdainful of countenance, with Telenger a conspicuous exception). Such structural flamboyance always seems to draw the viewer's eyes up to the skies, to which my sketch-work from my time in Firsthold attests. One simply needs to inspect the decorations carved into a boundary post to see how the lowliest palisade is made with the same care as a grand ceremonial altar. I had considered depicting a few of the banquet guests Telenger and I were staring at, but as the feast continued and we mopped up the remains of a sumptuous century soup with an ever-fresh loaf of bread, I ordered an ewer of metheglin, belched quietly, and observed the chamber: It seemed to me, with a creeping sense of alarm, that all the assembled guests were starting to look like the Altmer Mannimarco. Whether this was my own anxiety or the fermented grapes, I couldn't bring myself to paint these faces. Telenger beckoned me toward the kitchens; he had "acquired" a double carafe of Old Epiphany, and we immediately started toasting the return of Princess Ayrenn. My tipsiness temporarily quelled the fretting. After a number of drinks away from the throng, Telenger received a tap upon his shoulder. He turned and gave a surprisingly robust hug to an aged fellow clad in faded trappings that were rather garish for a High Elf. "This is Falarel. He was jester to the late Rilis XII." Falarel extended a gnarled hand attached to a jingling arm, small bells accompanying his handshake. Telenger told me Falarel was also a bard of some repute, and I was presented with a small scroll with a lament he had composed for me. Falarel whispered, "Telenger, I know how you love secrets. Follow me!" Falarel led us down staircase after staircase. As my liqueur-soaked mind took in new and musty surroundings, I realized we were descending into the vaults beneath the old castle. Falarel told us he'd recently taken up residence here and had started receiving nocturnal visits from Falarel's former (and deceased) master. We were stepping into haunted ruins, under-prepared and under the influence. Just as I realized we were among the wall-set tombs of the long-dead, our candles snuffed out. A whimper of fear from the elderly buffoon. An eerie glow from betwixt the rows of stone coffins. Then it was upon us. Rilis XII, now a shrieking ghost of hate and mania. In a haze, I blundered into a column, which was much less stable than I expected. It crumbled and collapsed, the largest of the masonry landing squarely on Falarel's head, crushing it into a pulpy ooze. Escaping the dungeons, we both felt the clamp of cold glass gauntlets on our shoulders. Our arrest was swift, and although I hid my culpability with the aplomb of a Bravilian actor, my inner mind was wracked with contrition. By Altmeri tradition, those burial vaults were out of bounds, so we waited for sentencing below the blossomed steps of the castle terraces. "Away with you." This was the extent of my conversation with Rilis XIII, current Kinlord of Firsthold, who frowned upon my disheveled form as if I were dung staining his royal carpet. I was guilty of "sacrilegious trespass" and taken back to the docks for immediate deportation to Valenwood. Telenger's whereabouts were unknown. Exotic and ornate. Perplexing in its strength and rigidity. Comfortable and functional despite all the conventional understanding to the contrary. The glass armor of the Altmer has baffled even the most consummate Imperial craftsmen since the First Era. Our inability to replicate its durability and flexibility has induced apoplexy in previously levelheaded artisans. 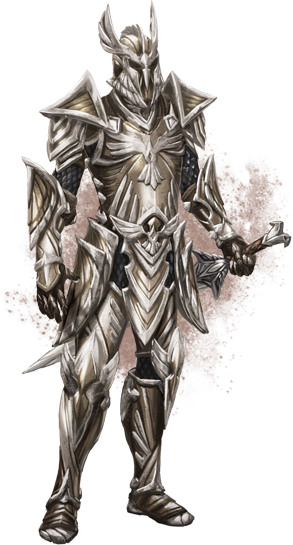 Somehow, Altmeri armorers are able to forge light and flexible bands of metal studded with glass. The resulting protection is interwoven at great expense but is preferable to steel due to its enhanced strength and ability to distribute and absorb impact damage. Such fine ligaments of protection show the great lengths to which the scornful Altmer will go to separate themselves from the much-belittled races of the mainland and their uncouth iron and steel suits. Distinctive and prized longswords, sparkling hand axes, dainty Elven daggers, and even intricately carved bows of glass have been collected for study. The High Elf weaponsmith is nothing if not extravagant in his use of rare materials. It seems elegance is as important as sharpness with an Altmeri blade, with every slicing edge fashioned from rare crystalline components harvested from volcanic sites. This raw glass has a partly translucent greenish tinge to it and is lighter and more flexible than even ebony. Such edges are almost unparalleled in their ability to draw blood and their lack of heft. The rogue or duelist favors such sinister sharpness. Magnificent workmanship is certain. I knew my actions, although accidental, required penance. But I was not prepared to have Falarel pick the punishment for me. For now, each and every time I close my eyes to sleep, that withered specter haunts my dreams; small bells tinkling, always he sings a lament about me with maudlin lute and reedy voice. I am a troll-hairbreadth away from mental cracking.